As a fully qualified, AAMET Accredited Emotional Freedom Techniques Practitioner and experienced Life Coach, I'm really excited by what can be achieved using this dynamic method. 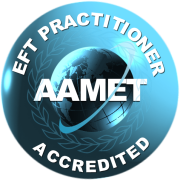 EFT delivers the physical benefits of acupuncture without the needles, and cognitive therapy for a more successful, long-term resolution. EFT is effective for a wide range of conditions from minor issues like physical pain, stress and anxiety, to more serious ones like phobias and addictions. Each session moves at your pace so that you progress at a rate that you are able process and maintain. There are really effective techniques such as Tearless Trauma and The Movie so that you can deal with your concern in safe incremental stages that you are comfortable with. You can also record your sessions on your smart phone so that you can focus entirely on being in the session. I have also found that EFT works just as successfully when conducting sessions via Skype or Facetime. EFT can have an immediate and profound effect. It is not unusual for 4-6 sessions to completely resolve even major, and long-standing issues.